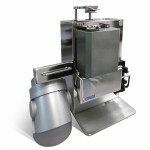 FEBO is an automatic syringe dispensing system for safe, accurate and fully automated dose-drawing of radioactive materials into a shielded, standardised 5 ml syringe. The dispenser unit can be operated via any standard PC or Laptop (Windows-based). All materials that hold or transport radioactive fluids during dispensing are disposable and can be replaced per day or after each bulk activity vial. The dispensing unit is intended to be positioned inside a Laminar Flow or Hot cell cabinet. The dispensing process includes integrated dose activity measurement with a special digital ionisation chamber.